Audio Pro Addon C5A review | What Hi-Fi? Audio Pro’s addition of Alexa Voice Control to an already class-leading speaker is exactly the type of success we could have predicted. As headlines go, Audio Pro receiving five stars for one of its speakers ranks closer to ‘dog bites man’ than the more sensational ‘man bites dog’. In this review, it’s even less of a surprise, given that the Audio Pro Addon C5A is almost identical to the Addon C5, which was our wireless speaker Product of the Year in 2017. The C5 was also part of the group that earned Audio Pro its first multi-room Award in 2018, and only missed out on an individual Award last year because we opted for the cheaper Addon C3 and more expensive Addon C10 that sandwich it in the range. The ‘A’ added to the model number refers to the Alexa voice control capabilities Audio Pro has built in to this version. There is a control bar behind the handle where the microphones book-end buttons for turning on and controlling them and an LED volume indicator – but otherwise there’s nothing else to distinguish the Addon C5A physically from its nearest cousin. On the front panel, you’ll find buttons for source selection – wi-fi, Bluetooth, aux and line-in – volume control, four presets and the 3.5mm analogue input. The back of the unit houses the Addon C5A’s RCA input, subwoofer out, USB charging point and ethernet terminal. Internet connectivity also places it firmly in Audio Pro’s Award-winning multi-room family. The Addon C5A retains the Addon C5’s driver configuration: a 10cm woofer flanked by a pair of 18mm tweeters. Though Audio Pro has recently changed tack with its cylindrical A10 speaker, it has opted not to tamper with the consummately class-leading performances of this Addon range. The Addon C5A welcomes us with that same Award-winning musical understanding. There’s plenty of bass for a unit this size, and a level of detail we’ve become used to from these speakers, but the highlight is undoubtedly these boxes’ level of expression. Rhythms snap in time, with instruments expertly organised and dynamics effortlessly contoured. 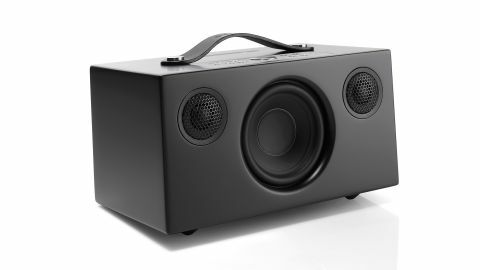 We’re not talking hi-fi, of course, but as far as wireless speakers of this size and price go, we could barely hope for a manufacturer to better understand what makes a track tick. Most importantly for this particular speaker, though, is the question of how well Audio Pro has integrated its voice control abilities, and whether there is enough reason to pay the extra over a regular Addon C5. If you’re already sold on the idea of talking to your speakers, the Addon C5A ticks all the boxes. Set-up is simple via the Audio Pro app, it understands our requests and we were able to capture its attention even with music playing full blast. Ultimately, the Addon C5A is more of an update than an upgrade on its non-Alexa namesake. Available for the price of an Addon C5 plus the cost of an Amazon Echo product bolt on, it brings the whole package into one tidy box.